Finland (in Finnish Suomi) is a republic in northern Europe, bounded on the north by Norway, on the east by Russia, on the south by the Gulf of Finland and Estonia, on the south-west by the Baltic Sea and on the west by the Gulf of Bothnia and Sweden. Nearly one third of the country lies north of the Arctic Circle. 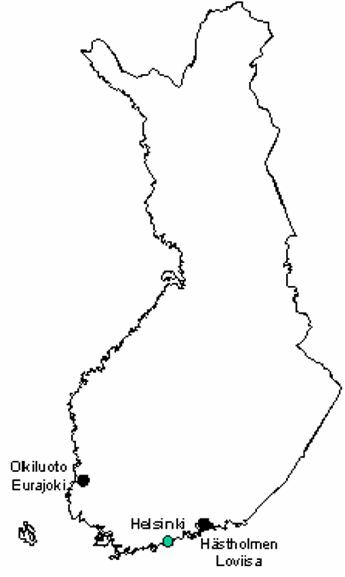 The total area of Finland, including 31 557 km2 of inland water, is 338 000 km2. The terrain is generally level, hilly areas are more prominent in the north and mountains are found only in the extreme north-west. The average July temperature in the capital Helsinki on the southern coast is 17 °C. The February average in Helsinki is about -5.7 °C. The corresponding figures at Sodankylä (Lapland) in the northern Finland are 14.1 C and -13.6 °C. Precipitation (snow and rain) averages about 460 mm in the north and 710 mm in the south. Snow covers the ground for four to five months a year in the south, and about seven months in the north. Finland has a population of 5.2 million and an average population density of 17 per km2 of land. Historical population data is shown in Table 1. The predicted annual population growth rate between the years 1998 and 2010 is 0.21%. More than two thirds of the population reside in the southern third of the country. In Finland the total primary energy consumption2 per capita was about 65% higher than the European Union average (according to 2001 statistics) and about 39% higher than the OECD average. This is mainly due to the weather, which demands space heating for most of the time, and the structure of the industry, which is energy intensive processing industry (wood, especially paper, heavy metal and chemical). A third factor is relatively high transportation requirements per capita caused by the low population density. The Gross Domestic Product (GDP) is given in Table 2. Finland's energy mix is diverse and well balanced, and many of its power plants can be optimised for up to three different fuels. About 40 per cent of all Finnish homes are connected to district heating networks. In 2002, 75 per cent of all district heat was produced in combined heat and power plants. Finland is highly dependent on foreign energy supplies. Crude oil and oil products constitute a major part of imported energy. Other main fuels imported to Finland are coal and natural gas. During the last years the imports of gas have had the fastest growth rate. Discussions on the possibility to expand the use of natural gas by adding a redundant source primarily from the Norwegian offshore deposits have continued, but are unlikely to lead to solution increasing the gas import to Finland during the next decade. Also alternative routes to gas supply sources in Russia are under investigation. The primary indigenous energy resources in Finland are hydro power, wood, wood waste, pulping liqueurs and peat. The peat resources are about 800 - 1000 Mtoe (34 42 EJ) and reserves are estimated at 280 Mtoe. These could be exploited with an annual rate of 4.0 - 4.7 Mtoe for about 60 years. The use of wood and wood based fuels in 2003 was 6.85 Mtoe corresponding to 19% of the total primary energy consumption. Unexploited hydropower reserves are estimated to correspond to an annual production of the order of 7.0-8.5 TW·h. However, most of the unharnessed river areas are either nature reserves or frontier rivers or tiny waterfalls. Indigenous fuels and hydropower covered 29.3% of the energy demand in 2003. 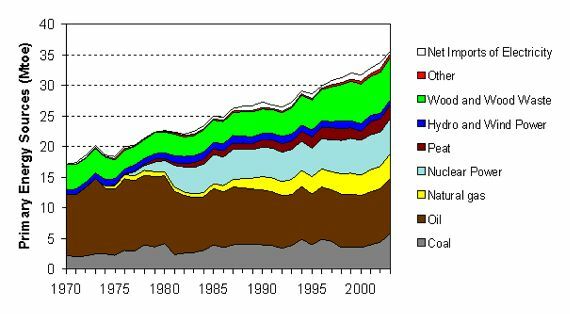 Finland imports all of its oil, natural gas, coal and uranium. Total demand for primary energy in 2003 was 35.5 Mtoe (1.49 EJ) and the different energy sources used are given in Table 3. 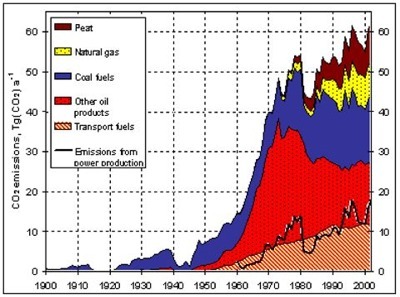 The long-term trend of energy supply from 1970 onwards is depicted in Fig. 1 and the trend in energy consumption in different sectors in Fig. 2.
a Using the definition adopted by the IEA and the CEC (nuclear power is converted into primary energy with a 33% gross efficiency, and hydro and wind power as well as imported electricity with 100% efficiency). This definition has been applied in Finland since 1997. FIG. 1. Energy Supplies (Mtoe) in Finland. Source: Energy Statistics 2003. FIG. 2. Energy consumption in different sectors (PJ). In 2003 the shares of the sectors were: industry 49%, space heating 22%, transport 16%, and others 13%. Source: Energy Statistics 2003. High proportion of energy-intensive processing industries and high requirements for space heating and long transportation distances make the total energy consumption per capita in Finland one of the highest in the OECD area. In 2003, the primary energy consumption per capita in Finland was 6.8 toe. The historical energy statistics are given in Tables 4 and 5. Source: Energy Statistics 2003, Statistics Finland. The objectives of Finnish energy policy are: security of supply; effective energy markets and economy; environmental acceptability and safety. In Finland, energy supply decisions on energy systems take place at a fairly decentralised level with the exception of nuclear power. A substantial proportion of energy is imported and produced by private enterprises. The energy companies with majority ownership by state are also run on a purely commercial basis. In 1994, Finland ratified the Framework Convention on Climatic Change. For the reference year (1990) of the convention, the total CO2-emissions in Finland were 53.9 million tons and the total emission of greenhouse gases (GHG) 77.2 Mt CO2 eq. In the Kyoto Protocol to the Framework Convention on Climatic Change the EU commitment is to reduce greenhouse gas emissions, calculated as an average of the emissions between 2008 and 2012, by 8% from the 1990 level. According to the burden sharing between the EU countries, Finland's commitment is to return the emissions to the 1990 level. Meeting the emission limits especially those of carbon dioxide - would be a challenging task to be accomplished without the expanded use of nuclear power and renewable energy sources. 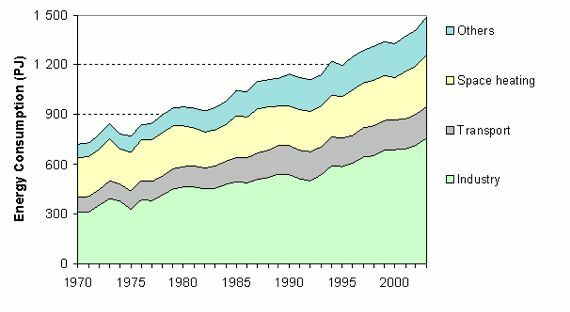 The long-term trend in CO2 emissions is depicted in Fig. 3. In years 1991 to 1993 the CO2 emissions decreased slightly below the level in 1990 and exceeded only slightly that reference level in 2000, when the hydro power production and net electricity imports had large share in electricity production. On the other hand in 2003 the CO2 emissions from fuel combustion were the highest (30% above the reference level) due to record low hydro power production in Finland since 1970 and very much lower net electricity imports. The main actions aimed to restrict the emissions growth have been increasing the use of wood-based fuels, natural gas, a substitute for coal, as well as upgrading the nuclear power plants. Energy conservation has also played a role. FIG. 3. Carbon dioxide emissions in Finland from fuel combustion by fuel type (left) and emissions of carbon dioxide from other sources plus other greenhouse gases (right). The National climate strategy lays down guidelines as to how Finland will meet the targets for greenhouse gas reduction agreed upon in the Kyoto Protocol. Preparation work was started in 1999, and the Strategy was approved by the Government in March 2001. Later same year the Finnish Parliament endorsed it in a statement. It is a generally accepted view that Finland should have an average annual economic growth of at least 2.5% for the next 30 years, in order to be able to reduce further the unemployment rate and, at the same time, reduce the foreign debt. Within this time frame, the growth of primary energy use is expected to slow down and even cease. 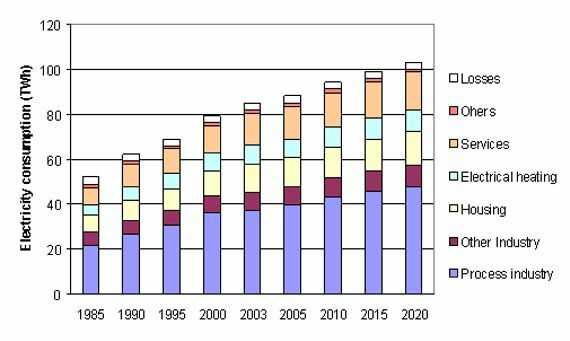 Considerable amount of new electricity production capacity (Fig. 4) is needed to meet the increased power demand and to compensate the decommissioning of older plants. According to the most recent scenario (Fig. 9) by the Ministry of Trade and Industry the consumption of electricity is expected to evolve from the 2000 level of 79.2 TW·h to 94.2 TW·h in 2010 and further to 103.3 TW·h in 2020. The Government is presently preparing the update of the Climate Strategy and the national Energy Strategy taking into account the recently published study, contracted by the Ministry of Trade and Industry, on the effects of emission trading. FIG. 4. The forecasted need for new power production capacity to meet the increased demand and to replace decommissioned power plants. Source: Energy Visions 2030 for Finland. Energy supply in Finland is highly competitive and both the state owned, municipality-owned and private sector energy and electricity supply utilities operate essentially on the same commercial basis as the industry in class=" general. The Finnish power system is widely decentralised and has a diverse organisation. The main types of ownership are: (i) partly privatised, state controlled power companies; (ii) industrial companies, and (iii) municipal and other distribution companies. There are 410 power plants in Finland in 2003 and about half of these are hydroelectric. Fortum Power and Heat Oy (previously Imatran Voima Oy; IVO) is the largest power producer in Finland. Industry and its electricity producing firms together have a share of approximately the same size. The rest of power is produced by the local and regional energy companies. In addition, Finland imports electricity from Russia and the Nordic electricity markets to satisfy its remaining energy requirements. Fortum is an international energy group formed through the combination of the earlier IVO Group (power and heat production) and Neste Group (oil and gas business). The main sectors of Fortum are (1) Power and Heat and (2) Oil. Fortum Power and Heat Oy (FPH) masters all aspects of energy services related to electricity and heat. Its business units include among others generation, distribution, heat and service. The company owns several power and heating plants as well as shares in power plants. It also operates the Loviisa nuclear power plant. Additionally, FPH purchases electricity from other Finnish and foreign companies and through the Nordic electricity exchange. Teollisuuden Voima Oy was founded in 1969 by a number of Finnish industrial companies with the purpose of building and operating large power plants. The company supplies electricity to its shareholders (Table 6) at production cost price. The Finnish power system (Fig. 5) consists of power plants, the main grid, regional networks, distribution networks and end-users of electricity. The system is a part of the interconnected Nordic power system together with the systems in Sweden, Norway and Denmark. Moreover, there is a direct current connection from Russia to Finland, enabling connection between the systems, which apply different principles, and also enabling power trading across the border. There is also a DC connection to Sweden under the Gulf of Bothnia and a link to Estonia is under planning. Furthermore, an application for establishing a direct link from Sosnovyj Bor in Russia to Finland was submitted to the authorities in 2004. Regional and distribution network activities are the responsibility of the electric utilities, which are licensed to operate their networks by the pertinent authority. Electricity transmission is priced using a so-called point-tariff system (postage stamp). The user can procure electricity from anywhere in the country without restriction. The user pays one grid transmission fee at his grid connection point, which covers the transmission costs for the use of the entire grid, without any additional fees. The producer can feed power into the network using the same payment principle. The grid operators are responsible for operating, maintaining and developing their networks. In the present situation there is a need to improve the monitoring of power grid operations because of their monopolistic nature. To accomplish this, a separate monitoring authority was set up, the Energy Market Authority. The transmission of electricity over the national grid as well as the boundary interconnections with Sweden, Norway and Russia are managed by a system responsible grid company Fingrid Plc., which is owned by the two major producers (Fortum and PVO), Finnish government and institutional investors. FIG. 5. The Finnish power system. The biggest bulk sellers of electricity in Finland are Fortum Power and Heat Oy, Nordic Energy Oy and Vattenfall. They sell electricity directly to large, business-to-business customers and electricity retailers. Electricity retail is carried out mainly by the local and regional electrical companies. There are about one hundred of these players in Finland. No special permits are required to sell electricity, so the industry is open to new competitors as well. 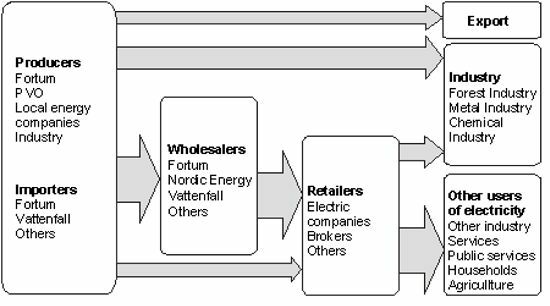 The electricity trade system in Finland is illustrated by Fig. 6. Industrial and domestic consumers are free to use the power supplier they prefer. The power industry is covered by the same laws as other commercial activities. Companies are fully responsible for their economic operations. The main government influence on energy decisions is through taxes and some minor subsidies. Anyone has the right to construct a power station or a transmission line. License for construction of power plants is needed only for nuclear and hydropower plants. New power plant projects (nuclear facilities and thermal power plants (>300 MWth)) and high-voltage transmission lines (= 220 kV) need to undergo environmental impact assessment procedure. The construction of a transmission line requires a license from the Energy Market Authority and a cross-border transmission line requires a license from the Ministry of Trade and Industry. The license of electricity imports has been abolished. This deregulation has made it possible for Finnish electricity consumers to co-operate directly with foreign power producers and traders. The state promotes the use of renewable energy and conservation measures by giving some investment subsidies or other forms of support. FIG. 6. Electricity Trade System. The decision-making process for building nuclear facilities is rather complex and requires (besides the normal environmental impact assessment procedure necessary for major power plant projects) ultimately also the approval of the decision-in-principle by the Parliament (cf. Section 3.1). The Nuclear Energy Act of 1987 defines the procedures required for new nuclear power plants irrespective of private or state ownership. The same is true what comes to other nuclear facilities, such as the waste management facilities, and to decommissioning. The historical trends of electricity supply and the installed capacities are given in Table 7. Table 8 gives additional details for electricity supply and consumption in the years 1997, 2002 and 2003. The total domestic electricity production in 2003 was 80.4 TW·h and the total consumption of electricity was 85.2 TW·h. The share of electricity supply in primary energy consumption is gradually increasing and reached the level of 43% in 2003 (Table 8). The trend of electricity supply from 1970 onwards is given in Fig. 7. The energy sources in electricity supply in 2003 are given in Fig 8. Geothermal .. .. .. .. .. .. .. ..
TABLE 8. ELECTRICITY SUPPLY (INCL. NET IMPORTS) BY PLANT TYPES AND CONSUMPTION IN DIFFERENT SECTORS IN 1997, 2002 AND 2003. 1 Primary energy; the definition of CEC used in conversion of electricity production into primary energy. In the cogeneration the actual efficiency achieved is taken into account. Sources: Energy Statistics 2003; Statistics Finland. FIG. 7. Electricity Supplies in Finland (1970 - 2003). FIG. 8. Electricity supply in 2003 by energy sources (total 85.2 TWh). The main sources of power production in Finland are thermal, nuclear and hydropower plants. In 2003 the shares of these sources in the domestic power production were 61%, 27.2% and 11.8%, respectively. So far only a very small volume (about 0.1%) of electricity is produced by wind power, although the relative increase of wind power capacity has recently been quite rapid. 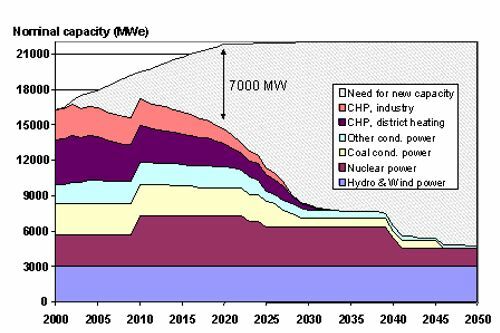 Finland's total power production capacity totalled at the end of 2003 about 16 900 MW; broken down as follows (Source: Nordel Annual Report 2003). In addition, electricity is imported from Russia and the Nordic electricity market. During 2003 about 71 MW of new capacity was connected to the grid and 44 MW of capacity was decommissioned. Furthermore, decisions have been taken to increase the power plant capacity as follows: industrial CHP plant (using waste wood) of 140 MWe to Pietarsaari and hydropower at two sites by 52 MWe. The application to obtain the construction licence for a 1600 MWe EPR-plant was submitted to the Government in January 2004. On January 1, 2003 the electricity transport capacity from Russia was increased from 1 000 MW to 1 400 MW. A record high electricity consumption of 14 040 MW took place shortly afterwards (January 3, 2003). The per capita electricity consumption in 2003 was about 16 300 kW·h. Electricity now represents about 42.5 per cent of the primary energy consumption. The share is expected to further rise. In the industry sector electricity is the main source of energy. In 2003, the Finnish industry consumed 45.2 TW·h of the electricity. As compared to the previous year the consumption of electricity by the industry went up 1% (0.6 TW·h). The most important branch is pulp and paper production, which in 2003 consumed about 58% of the total electricity needs of the industry. Other significant branches are the metal and chemical industries. Some energy related ratios are given in Table 9. In the national Climate Strategy of Finland (approved in 2001) different scenarios were presented for the development of electricity consumption. The revision of the climate and energy strategy is expected to be published in 2005. The most recent scenario (Fig. 9) for electricity consumption has been prepared by the Ministry of Trade and Industry for the National Allocation Plan for emission allowances. Electricity consumption in this scenario is increasing from 79.2 TW·h in the year 2000 and 84.8 TW·h in 2003 to 94.2 TW·h in 2010 and further to 103.3 TW·h in 2020. Consumption would increase by 32% from 2000 to 2020 in both process industry and housing, while consumption would increase by 34% in services and by 26% in electrical space heating. FIG. 9. Electricity consumption (TWh) in main consuming sectors in 1985 - 2020. The figures in this scenario are based on the estimates drawn up by the Ministry of Trade and Industry. Source: With Measures (WM) scenario in National Allocation Plan (2004). In 1990, Finland became the first country to enact an energy tax based on the carbon content of energy products. However, after the deregulation of the electricity market in 1995, this taxation system was found to impair severely the Finnish electricity producers' competitiveness in Nordic markets. Several changes have been implemented to reform the energy taxation and harmonise it with the practises within the EU. In 2003 the taxes are imposed on the use of electricity (for industry 4.4 €/MW·h and for other consumers 7.3 €/MW·h). In heat generation, the tax that is levied continues to be based on the carbon content of the fuel and not on the consumption of heating energy (CHP or other). The taxes on heat generation are determined on equal terms for all consumers. For comparison the minimum tax levels in the EC directive for the electricity tax for industry and other consumption are 0.05 and 0.1 €/MW·h, respectively. In the EC directive the same tax rate is valid for heat produced by CHP. The New Electricity Market Act (1994) came into force in 1995 and opened electricity market. According to the Act, transmission and distribution companies are licensed by the Electricity Market Authority. The licenses specify the franchised territory for the distribution companies. In Finland there is only one company (Fingrid Plc.) for transmission of high-voltage electricity. In their territories the distribution utilities are obligated to connect end-users and production sites to the distribution network against reasonable compensation. Transmission and distribution companies are obligated to transmit electricity in their networks if transmission capacity is available. Electricity retailers who have dominant market position in a distribution network have an obligation to offer electricity to small scale customers at a reasonable public price. Customers can choose between this local offer and any other offers on the competitive market. Foreign ownership in electricity supply is also possible. Generation and transmission investments are funded by loans from the domestic and international financial market, by self-financing and by equity capital. The state does not fund investments by the utilities and gives no guarantee for debts. The state is only involved as an equity investor in the state-owned companies and requires fair return on equity capital. As of the beginning of 1997, all electricity users have been able to freely select their electricity suppliers. From 1 September 1998, also all households have in practice been able to select supplier as changing the supplier does not any more require new metering equipment. The enforcement of legislation pertaining to Finnish electricity markets and the grid operators' operations are overseen by Energy Market Authority in collaboration with the Finnish competition authorities. The deregulation of Finnish electricity markets has had a significant role in the opening of Nordic markets. This was in the interest of both industry and domestic households. The Nordic Electricity Exchange will play an important role in the creation of a common market by bringing in new players and helping to develop new forms of commerce. The exchange started in 1998 and its operations are based on the present and future products and services of the Nordic NordPool electricity exchange. The existing nuclear power plants in Finland are operating as base load units and have had most of the time an average annual load factor of more than 90%. The electricity production costs are low for both Loviisa and Olkiluoto NPPs. The investment costs of the existing nuclear plants are to large extent already paid and the operating costs are low compared with conventional thermal power stations. Hence, the deregulation of electricity market does not have any significant impacts on the competitiveness of nuclear power. The present nuclear power plants will be even more competitive in case environmental fees, for example CO2 taxes, would be introduced. In that case, a long lifetime for most of the existing nuclear power plants can be foreseen. The Technical Research Centre of Finland (VTT) has a research reactor in operation since 1962. The Loviisa Power Plant units, on the southern coast (cf. Fig. 10), owned by Fortum Power and Heat Oy (Fortum), were ordered in 1969 and 1971 and started commercial operation in 1977 and 1981. The Olkiluoto Power Plant units, on the western coast, owned by Teollisuuden Voima Oy (TVO), were ordered in 1972 and 1974 and started commercial operation in 1979 and 1982. The Loviisa power plant has two Russian (Soviet) VVER (PWR) reactors and Olkiluoto power plant has two Swedish BWRs. At the start of the operation the nominal net capacity of the Loviisa units was 420 MW(e) each and the initial net rating of the Olkiluoto units was 660 MW(e) each. The power level (net) of the Olkiluoto units was raised to 710 MW(e) in 1984. In the connection of the latest operating licence renewal process and plant modernisation projects (cf. Section 2.2.3), the authorities approved in 1998 the uprating of the power production capacities (net) of the Loviisa and Olkiluoto plants up to 2 X 488 MW(e) and 2 X 840 MW(e). The nuclear steam supply system (NSSS) and twin turbine generators for Loviisa nuclear power plant were supplied by V/0 Atomenergoexport of the former USSR. Imatran Voima Oy, IVO (predecessor of Fortum Power and Heat Oy) acted as its own architect engineer and co ordinated the design and supply of equipment from several countries. This included the integration of West German instrumentation and, under Westinghouse license, an ice condenser containment system. The Olkiluoto units were ordered on turnkey contracts from Asea Atom (now Westinghouse Electric Sweden Ab). TVO had the responsibility for the second unit's civil engineering systems. In 1993, the containment buildings were retrofitted with Siemens filtered venting system. In 2003, 25.6% of the total electricity supply in Finland was produced by nuclear power. Finland's four nuclear power plant units (Table 10) have a total net capacity of 2 656 MW(e). They have operated reliably and complied with existing safety and environmental protection standards. For years, the annual load factors of all the units have been around 90%. Both companies have invested a lot to keep the annual outages as short as possible. During 2003, all the Finnish nuclear power units continued very reliable operation. Source: IAEA Power Reactor Information System (PRIS), 31 December 2006. The historical trend of annual load factors of the Finnish nuclear power plants is shown in Fig. 11. The development of annual occupational collective doses (manSv/a/reactor) of the Finnish nuclear power plants (both with 2 reactor units) are shown in Fig. 12. FIG. 11. 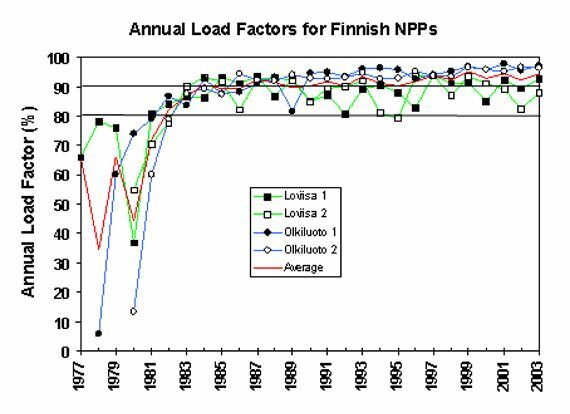 The development of annual load factors of the Finnish nuclear power plants. FIG. 12. The annual occupational doses per rector unit to the personnel of the Finnish nuclear power plants as compared to the average world experience (ISOE statistics of OECD/NEA). The previous operating licenses of all four Finnish power reactors were valid until the end of 1998. The applications for renewal of these permits were submitted for regulatory review in 1997. Major modernisation and power uprating actions were carried out in the connection of the licence renewal process. Several technical modifications at the plants and thorough updating of the Final Safety Analysis Reports were necessary. In April 1998 the Government granted the licence to the Loviisa 1 and 2 plant units at the uprated power level. The licence is valid up to the end of 2007. It also covers the repository for low and medium level nuclear waste and interim storages for spent fuel including the necessary expansion of these facilities. The licence for the operational waste repository is valid until the end of 2055. The thermal power of both Loviisa units was uprated to 109% from the rated power specified in the former operating licence. The application of new operating licence of Olkiluoto NPP was for uprated 115.7% reactor power. The Government granted the licence to Olkiluoto 1 and 2 units in August 1998 at the uprated power level. The licences are valid for both units up to the end of 2018. By the end of 2008, the utility must submit to STUK a comprehensive periodic safety review report, after which STUK makes its own safety assessment. The upgrading of nuclear power plant capacity in 1997 - 1998 was altogether 350 MWe. As preparatory actions before filing of an application for the decision-in-principle of Government and Parliament for a new nuclear power plant unit, the nuclear power companies Fortum and TVO carried through the Environmental Impact Assessment procedure for new NPPs at either Olkiluoto or Loviisa sites. The environmental impact assessment reports for both locations were submitted in August 1999 for review to the contact authority, Ministry of Trade and Industry. The Ministry gave its final statements in February 2000. On 15 November 2000, TVO submitted an application for a decision-in-principle to the Government on the construction of a new nuclear power plant unit. The application for a decision-in-principle proposes that the unit be constructed either in Eurajoki, Olkiluoto, or in Loviisa, Hästholmen, near the already operational power plants. In the application the nuclear power plant unit was proposed to be equipped with a light water reactor, either a boiling water or pressurised water reactor with an electrical output of 1000 1600 MW. Each of the municipalities of the alternative sites accepted the construction of a new nuclear power unit. A preliminary safety appraisal of the project by STUK, the Radiation and Nuclear Safety Authority of Finland, was completed in February 2001. The Government made a decision-in-principle on the construction of the new nuclear power plant unit on 17 January 2002. By virtue of the Nuclear Energy Act, the decision was still to be subjected to the ratification by Parliament. This ratification took place in 24 May 2002 with votes 107 - 92. The decision-in-principle will be in force for five years from the ratification. The company launched a competitive bidding late 2002 and got the offers in spring 2003. The owners of TVO made their final decision on the choice of the plant type on the basis of the result of this bidding late 2003. The company submitted the constriction permit application in the beginning of 2004. It chose the plant site Olkiluoto on October 2003. The Finnish Government will handle the construction license and the operating license, which is to be applied for at a later date, and the handling will comprise wide-scoped statutory consultation and hearing procedures. It has been estimated that the Government will have concluded the construction permit's handling process by the year 2005. If the decision is favourable, an application for the statutory operating licence is expected in the end of approximately a four-year construction period. Commissioning of the plant unit could be envisaged in 2009. The energy policy decision now ratified supports the implementation of the National Climate Strategy adopted in 2001. Finland is now better equipped to meet her international emissions reduction commitments. The decision-in-principle now ratified is based on the view that the nuclear power option is the most cost-effective alternative, both in terms of central government finances and national economy, for generation of baseload power within the framework of the Kyoto Protocol. In addition, it will lead to a more stable price of electricity in Finland. No decommissioning projects are presently underway. Authorities require that the plans for the decommissioning of the nuclear facilities in Finland must be updated every five years. The financial liability for future waste management (cf. Section 2.5.3) covers decommissioning costs as well. There are no domestic suppliers of whole power plants or nuclear steam supply systems (NSSS). However, the Fortum Nuclear Services Oy provides technical support to the Loviisa NPP owner Fortum Power and Heat Oy and subsystem design services to Finnish and foreign customers. In addition, there are Finnish suppliers of smaller components. During the construction of the existing NPPs the collaboration with foreign vendors provided Finnish companies with experience in supplying certain mechanical equipments to nuclear power stations. Domestic capabilities have thereafter also been developed for simulators, fuel handling, storage equipment, radiation dosimeters and monitoring equipment. The design, deliveries and installation works in the connection of the modernisation projects were carried out by domestic and foreign companies. The operation, maintenance, and training at Loviisa are carried out by FPH. TVO takes care of the operation and maintenance and the operator training for Olkiluoto. After joining the European Union the requirements of Euratom have been adopted in nuclear fuel supply to the Finnish NPPs. Until the late 1990's the fuel to the Loviisa NPP came from the Russian supplier. Then the operator FPH started efforts for acquiring an optional fuel supplier from western sources besides the Russian fuel supplier. Together with the Hungarian Paks utility, test fuel assemblies have been bought from the BNFL. First lead assemblies from BNFL were loaded in Loviisa in 1998 and from 2001 onwards part of the fuel for Loviisa NPP has been delivered by the BNFL. Uranium for TVO 1 and TVO 2 comes (or has come) from Canada, Australia, Niger, China and Russia. Most of the enrichment has taken place in Russia, the rest in Western Europe. Fuel elements delivered to Olkiluoto have been manufactured by ABB Atom in Sweden, Siemens in Germany and GENUSA in Spain. Spent fuel from the reactors is stored for a few years in the fuel pools at the reactor buildings. Thereafter, spent fuel elements are transferred to interim spent fuel storage at the power plant sites. FPH and TVO are responsible for the management of spent fuel. A specialised company, Posiva, which is jointly owned by the nuclear power companies TVO (60%) and FPH (40%), is taking care of the necessary R&D activities, design and implementation of the spent fuel disposal project in Finland. In the future Posiva also aims to supply similar design services for the needs of other countries. The repository for medium and low-level wastes has been in use since 1992 at the Olkiluoto site. A similar facility has also been in use since 1998 for low-level waste disposal at the Loviisa site. The disposal facility at Loviisa is being expanded for disposal of medium level wastes as well. Power companies in Finland pay annual contributions to the State Nuclear Waste Management Fund, which is a segregated fund operating under the auspices of the Ministry of Trade and Industry. This provision covers all future measures: treatment, storage and final disposal of spent fuel and radioactive waste, as well as decommissioning of the plants. The power companies contributing to the fund are entitled to borrow back 75% of the contributions against securities. Posiva Oy takes care of the R&D activities and realisation of the spent fuel disposal facility in Olkiluoto. The power companies take care by themselves of other actions in spent fuel management. In addition, FPH and TVO take care of the management of medium and low-level operational wastes and the decommissioning of the nuclear power plants and the management of the thereby arising wastes. FPH and TVO are independently responsible for funding of all nuclear waste management activities despite their co operation on spent fuel disposal. The first medium and low-level waste repository located in Olkiluoto was commissioned in 1992. The operation licence was granted in 1998 for the first phase of the second repository for low-level maintenance wastes at the Loviisa NPP site in Häästholmen. To ensure that the financial liability is covered, the utilities must each year present cost estimates for the future management of nuclear wastes, including decommissioning of NPPs. The latest estimate (2003) for the total fund target, including costs from management of existing waste quantities and from decommissioning of NPPs, arises to 1 338 million € with no discounting. The utilities are obliged to set aside the required amount of money each year to the State Nuclear Waste Management Fund. The administrative procedures of the funding system are described in detail in the nuclear energy legislation. 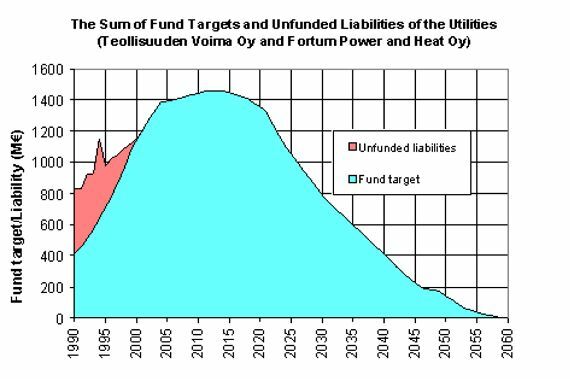 The past and expected future development of the total fund holdings and unfunded liabilities for the existing reactors are depicted in Fig. 13. At the end of 2003 the funded money covered the whole liability. 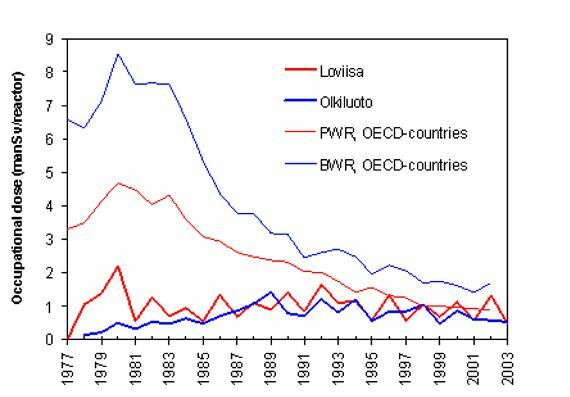 The peak of the liability curve in 1994 is due to the termination of Loviisa spent fuel returns to Russia and the subsequent decrease is due to the spent fuel management co-operation agreement between Fortum and TVO. In rough terms, the cost for nuclear waste management, including plant decommissioning, is 2.1 €/MW·h (with no discounting), representing about 10% of the total power production cost. The amendment to the Nuclear Energy Act in 1994 halted Loviisa NPP's spent fuel shipments to Russia (Chelyabinsk) in 1996. Fortum and TVO agreed on co operation in nuclear waste management concerning spent fuel treatment and disposal. However, the final responsibility for nuclear waste management stays with the company who produced the waste. In May 1999, Posiva Oy completed the Environmental Impact Assessment -reporting on construction of the final disposal facility for spent nuclear fuel. The report covered four alternative locations. At the same time Posiva Oy submitted an application for the decision-in-principle to the Government based on one site; i.e. the Olkiluoto NPP site. The municipality of Eurajoki accepted the construction of the facility in Olkiluoto. On 21 December, the Government made a decision in principle and in May 2001 the Parliament endorsed the decision of the Government with a 159 - 3 majority of votes. FIG. 13. The sum of fund targets (for the existing reactors) in the Nuclear Waste Management Fund and unfunded liabilities covered by securities. The decision applies to the spent nuclear fuel from the existing power plants. In accordance with the decision, the maximum amount of the fuel to be disposed of in the final repository is 4000 tons, which is the amount generated by the existing nuclear power plants during 60 years of operation. According to the present plans the construction licence application for the facility will be submitted to the Government in 2012. The operation is planned to start around 2020. In the connection of the approval of the decision-in-principle for the fifth nuclear power plant unit, Parliament also ratified a separate decision-in-principle on the final disposal of spent nuclear fuel arising from the operation of the new nuclear power plant unit. Thus the spent fuel of the new nuclear power plant unit would also be disposed of in the bedrock in Olkiluoto. The estimated total amount of spent fuel from the five units is about 5 800 tU. At the end of 2003 Posiva published a three-year programme for the research, development and technical design (RTD) work for the nuclear waste management of the Olkiluoto and Loviisa nuclear power plants ("TKS-2003") (in English, see www.posiva.fi/esitteet/TKS-2003.pdf). The programme will start a new practice of triennial programme reports, which, in addition to planned activities, will also make a summary of the most recent achievements during the previous programme period. The focus of these programmes is on the spent fuel disposal. Accordingly, the next reports will be published in 2006 and 2009. This practice of triennial programme reports complements the system based on the legislation, according to which updated plans of nuclear waste management have to be presented annually to the Ministry. The time table of the triennial reporting is consistent with the revised guidelines of the Ministry of Trade and Industry (KTM) for the spent fuel disposal programme. According to the KTM's decision, Posiva has to present the first template versions of the documents needed for the construction license application in 2009 and the full PSAR documentation should be ready for submission in 2012. The target year for starting the disposal operations remains 2020. The overall time table for the disposal of spent fuel from the Finnish nuclear power plants is illustrated in Fig. 14. FIG. 14. 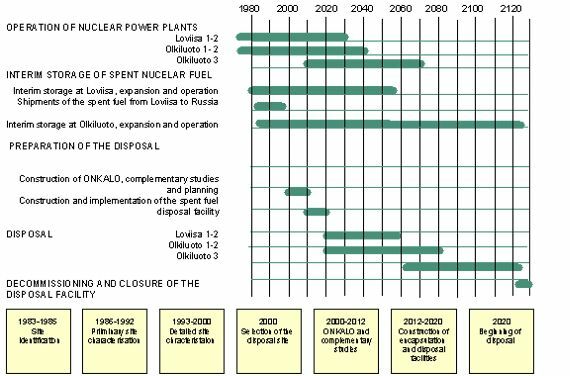 Time table for the disposal of the spent nuclear fuel from the nuclear power plants at Loviisa and Olkiluoto. Posiva has continued the preparations for the start of construction of the Olkiluoto Underground Rock Characterisation Facility, ONKALO. The final design was completed and the call for bids for the tunnel excavation work was sent out in the late 2003. The excavation started in summer 2004 and the target repository depth of 420 metres is planned to be reached in 2008. An important starting point for the design has been that the ONKALO may also become a part of the actual repository. Most of the work for development of the disposal technology is organised in cooperative projects with the Swedish SKB. An important joint project is the study of a horizontal alternative of the basic KBS-3 concept. In this concept the canisters would be emplaced directly in tunnels instead of the deposition holes. Posiva is in charge of the safety analysis of the horizontal concept. The focus of nuclear R&D is on the safety and operational performance of the power plants, and on the management and disposal of wastes. Publicly funded nuclear energy research provides impartial expertise in nuclear energy issues. It contributes to maintaining the necessary personnel and equipment for research and development, and has established the framework for international collaboration. The annual total volume of Finnish research into nuclear fission and fusion energy, including the R&D contracted by the industry, is estimated to be 200 man-years, and the total funding about €30 million. The Advisory Committee on Nuclear Energy (YEN) assists the Ministry of Trade and Industry (KTM) in directing the publicly funded nuclear energy research. KTM has appointed steering and review groups to supervise and direct publicly funded research. Currently, the fourth generation of programmes is under way. In addition to the national research programmes the nuclear utilities and the nuclear waste management company Posiva Oy carry out and finance extensive R&D programmes to support their own activities. More than half of the industry's R&D efforts are devoted to nuclear waste management. Furthermore, the Radiation and Nuclear Safety Authority (STUK) orders contracted research to support their independent reviews of licensing applications. The costs of these studies are reimbursed by the industry. The Nuclear Energy Act has been changed in late 2003 to ensure funding for a long term nuclear safety and nuclear waste management research in Finland. The objective of the Funds is to ensure the high level of national safety research and to maintain the national competence in the long run. Money is collected annually from the licence holders to special funds devoted to this purpose. For reactor safety research the amount of money is proportional to the thermal power of the licensed plant or the thermal power presented in the Decision-in-principle. For the waste research, the payments are proportional to the payments to the fund targets in the Nuclear Waste Management Fund. The total annual volume of these research funds for reactor safety and nuclear waste management is about 4 M€. The research projects are selected so that they support and develop the competences in nuclear safety and nuclear waste management. Finland has no institutes dedicated solely for nuclear research. Most research takes place at the Technical Research Centre of Finland (VTT). Other major research institutes include the universities of technology in Helsinki and Lappeenranta (HUT, LUT), the Geological Survey of Finland (GTK), the Finnish Meteorological Institute and the universities of Helsinki, Kuopio, Tampere and Jyväskylä. In addition, the Radiation and Nuclear Safety Authority (STUK) and the power companies FPH and TVO carry out internal research or finance research in the research institutes or universities. The Finnish public nuclear energy research is organised into national research programmes. These research programmes are operated mostly on funding provided by the dedicated funds (for reactor safety and nuclear waste management) described above. Additional funding is provided by the National Technology Agency Tekes, VTT's basic funding, and the European Union. The main objective of these programmes is to provide the authorities with high-standard expertise and research results relevant for the safety of nuclear power plants and waste management and disposal, and to support various activities of the authorities. Also these programmes train new nuclear experts and they promote technology and information transfer. SAFIR 2003 - 2006 is the Finnish public research programme on nuclear power plant safety. The programme is administrated by the steering group that has been nominated by the Ministry of Trade and Industry (KTM). The research performed currently in 23 projects is supervised by six reference groups. The programme is managed by the coordination unit VTT Processes, the programme director and the project managers of the individual research projects. The main funding sources of the programme in 2004 are the dedicated Reactor Safety Research Fund established within the State Nuclear Waste Management Fund (VYR) with 2.7 M€ and Technical Research Centre of Finland (VTT) with 1.3 M€. KTM, VTT, Radiation and Nuclear Safety Authority (STUK), and the power companies Teollisuuden Voima Oy (TVO) and Fortum Oyj along with National Technology Agency Tekes and Helsinki and Lappeenranta Universities of Technology are represented in the steering group of the programme. KYT 2002-2005 is the Finnish Research Programme on Nuclear Waste Management The programme is supervised by the steering group that has been nominated by the Ministry of Trade and Industry (KTM). The programme is coordinated by VTT Processes. The annual volume of the programme in 2004 is 1.1 M€/year. The main funding source is the dedicated Nuclear Waste Research Fund established within the State Nuclear Waste Management Fund. Organisations belonging to the Steering Group, i.e. KTM (Ministry of Trade and Industry), STUK (Radiation and Nuclear Safety Authority), Posiva, Fortum, TVO (Teollisuuden Voima Oy), Tekes (National Technology Agency of Finland) can bring projects they fund into the research programme. Main topics of the KYT programme are long-term safety of geological disposal of spent fuel and strategic alternatives for nuclear waste management. Studies directly related to licensing issues are excluded from KYT in order not to jeopardise the expected neutrality of the research. Outside the KYT programme, the industry is conducting or financing separate R&D activities of much larger volume on nuclear waste management, especially on spent fuel disposal. The FUSION Technology Programme of Tekes (National Technology Agency) covers all fusion energy research in Finland. The FUSION research activities are fully integrated into the European Fusion Programme through the Contract of Association between Tekes and Euratom. Association Euratom-Tekes is one of the 21 Fusion Associations of the European Fusion Programme in the sixth EU Framework Programme. Multilateral European Fusion Development Agreement (EFDA) and bilateral Contracts of Associations are the main tools for steering the fusion research activities in Europe. The main research areas of the programme are: (1) Fusion Plasma Physics, (2) Plasma-Wall Interactions, (3) Reactor Materials Research, (4) Development of Superconducting Wires, (5) Remote Handling Systems, and (6) System Studies. The total volume for the national research programmes (SAFIR & KYT) on nuclear fission energy is about 50 person-years annually. Nuclear fusion research comprises about 25 person-years. At present, the total annual volume of all nuclear energy research in Finland is estimated to be some 200 person-years. In January 1998, VTT launched a four-year research programme under the name "Advanced Light Water Reactors (ALWR)". At the beginning of the programme, VTT participated in several INNO-cluster projects within the 4th Framework Programme of the European Commission. The largest 4th Framework Programme project included passive safety injection experiments at Lappeenranta University of Technology for the investigation of a passive core make-up tank (CMT). Co-operation with European reactor vendors, Westinghouse Atom and Framatome ANP, started in 1999 and continued in 2000 and 2001 with several projects connected to the new European BWRs, SWR-1000 and BWR90+. The co-operation with TVO and GE on the development of ESBWR also continued. One common feature of the new research projects has been the increasing use of multidimensional computational fluid dynamics (CFD) codes for the development and evaluation of ALWRs and passive safety systems. In the area of new generation nuclear reactor systems VTT has participated in the projects of EU's 5th and 6th framework programme belonging to the area of new innovative systems. One example is the project "High Performance Light Water Reactor (HPLWR)". In addition, in the KYT research programme there have been restricted activities in the area of advanced fuel cycle concepts primarily the follow-up of research activities on partitioning and transmutation. Based on the initiative of the Advisory Group on Nuclear Energy (YEN), the planning of a new research programme on advanced nuclear energy systems is going to be started in 2005. The aim of the research programme would be the further support of maintaining and developing of the national expertise and international co-operation. Finland participates in IAEA work on all programme areas. The main emphasis is on nuclear safety and safeguards programmes. Finland also supports the IAEA's work through voluntary contributions. Finland is a party to all IAEA conventions except the Vienna Convention on third party liability. When Finland joined the European Union from the beginning of 1995, it also became a member of the European Atomic Energy Community, Euratom. In March 1995, Finland made the first contract of association with the European Commission to participate in research on controlled thermonuclear fusion. Through this contract, Finland is also involved with the global International Thermonuclear Experimental Reactor (ITER) project. The contract has been renewed for the new research period 2003-2006. As a member of the European Union, IAEA, OECD/NEA and Nordic Council of Ministers, Finland participates in most nuclear research and development activities conducted by intergovernmental organisations. Multilateral co-operation is supplemented by several bilateral projects and co operation agreements that the Finnish research institutes, safety authorities and industrial enterprises have with foreign organisations. The importance of international co-operation in reactor safety and nuclear waste management research and development is most evident in experimental research and development of large computer codes where large manpower and financial resources are involved. Finnish research institutes and companies have been well presented in the Euratom research programme. Finnish institutes and companies have been involved in altogether 47 research projects and networks of the 5th framework programme of the Euratom. In the 6th framework programme new instruments, such as integrated projects, have been introduced and the number of projects has generally decreased. The Finnish organisations are involved in 17 research projects at the end of 2004. Finnish nuclear safety authorities and nuclear research institutes take part in committees and expert groups established in OECD/NEA. Finland has been a member of the OECD Halden reactor project since its beginning in the late 1950's. The five Nordic countries have carried out joint research programmes since 1977. The goal is to maintain a high level competence in the field of reactor safety, waste management and emergency preparedness as well as promoting a unified view on safety issues. The current sixth programme covers the years 2002-2005. Finland's bilateral assistance in the field of nuclear safety and other sectors of nuclear technology is mainly directed to the neighbouring areas in Russia and the Baltic states and to Ukraine. In Russia, work is focused on the Kola and Leningrad nuclear power plants. By the end of 2004, Finland's total financial commitments in regard to Russia and CEECs for nuclear safety amounted to about 33 million €. The Nuclear Energy Act was amended in 2003 to establish the Nuclear Safety Research Fund. The main objective of this Fund is to maintain the national competence in the long run. A Fund for Nuclear Waste Safety Research was also established, respectively. These funds provide financing for the national research programmes on nuclear fission energy (cf. Section 2.6). One key objective of these national research programmes is to train new nuclear experts to meet the requirements for additional human resources owing to the Olkiluoto 3 project and to the large number of present experts retiring within the next 5-10 years. The licensee has the prime responsibility for ensuring that his employees are qualified and authorised to their jobs. Both Finnish power companies have training organizations and training facilities at NPP sites with the training staff round ten persons and full-scope plant-specific training simulators. Both utilities have a systematic approach to training. However, changes in energy markets and the fast development of technology will bring new challenges to the knowledge, and this requires special emphasis of all parties. During 2003-2005 two five - six week training courses on nuclear safety technology are provided to train newcomers in the nuclear field as a specific co-operation of all nuclear related organizations. About 100 young experts and new comers are trained during the courses. Training materials are developed that can be used by the organizations in their internal training programmes as appropriate. General safety regulations are issued by the Government. Detailed regulations and regulatory guides are issued by the Radiation and Nuclear Safety Authority (STUK). 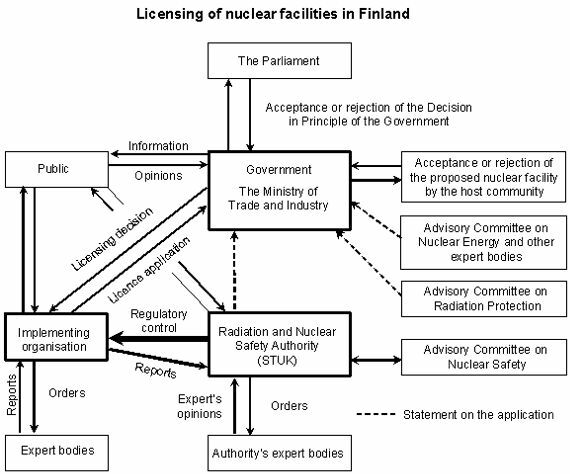 The licensing of nuclear installations in Finland (construction permit and operation license) is the responsibility of the Government. A major nuclear facility also needs a positive decision-in-principle by the Government, subject to ratification by the Parliament. However, licenses for small nuclear facilities (e.g., research reactors with thermal power below 50 MW(e)) are granted by the Ministry of Trade and Industry, which has overall responsibility for control of nuclear energy in Finland. In Finland, the overall management and supervision of nuclear matters is the responsibility of the Ministry of Trade and Industry (KTM). The Ministry also carries out the preparation of the policies and licensing procedures for adaptation by the Government. Preparation of legislation drafts and implementation of international agreements, supervision of nuclear waste management, and administration of the state's nuclear waste management fund are the duties of the Ministry's Energy Department. The Ministry is assisted by the Advisory Committee on Nuclear Energy (YEN) for the preparation of the most important matters related to nuclear energy. the import of nuclear explosives or the manufacture, possession or exploding of such explosives in Finland is prohibited. The application for the Government's decision-in-principle (see Fig. 15) may concern one or more alternative nuclear installation projects. The application shall include as an annex the final report of the Environmental Impact Assessment procedure conducted according to the requirements set in the corresponding law. Before the decision is made, an overall description of the installation including environmental effects and safety plans are made available to the public. Public and local authorities are given the opportunity to present their opinions in a public hearing. If the general prerequisites are met and if the municipal council of the site in question is in favour (binding right of veto of the host municipality) of the construction of the installation, the Government may make the decision-in-principle. The decision is submitted to the Parliament, which either confirms or rejects it (political consideration). The Government enforces regulations on nuclear safety, security and emergency preparedness drafted by STUK. The Ministry of Interior is responsible for regulating public rescue services. The applications for the construction and operation licences are submitted to the Government. The application for a construction license is more detailed than the application for the decision-in-principle and includes safety analysis reports and security plans. On behalf of the Government, the Ministry of Trade and Industry then asks several statements. The most important one is the statement of the Radiation and Nuclear Safety Authority (STUK) on safety of the facility. Construction License documents to be submitted to STUK for approval in this phase are defined in Nuclear Energy Degree § 35. After receiving all statements for the Construction License application, the Government will make its decision. The application for an operating license must be accompanied with detailed construction information of the facility and cover the facility's operation plans. The license can be granted only for a fixed period. During the operation, a nuclear power plant is subjected to three types of regulatory inspections: periodic inspections; inspections that the operating organisation must pass in order to continue operation; and, continuous re evaluation of the safety level of the operating plant. Operating licenses are granted for a limited period. When renewing a license, an overall evaluation of the safety of the plant is carried out by STUK. The Nuclear Energy Act 990/1987 and Decree No. 161/1988 give the Parliament the final authorisation for building new major nuclear installations including waste disposal facilities. The Act and Decree also define the licensing procedure (e.g. handling of construction and operation licence applications), the conditions for the use of nuclear energy as well as waste management (including the scheme to ensure that sufficient funds are collected for future waste management). Furthermore, they define the role and tasks of the different parties involved in the regulation, licensing and operation of nuclear facilities, such as the responsibilities and authority of STUK. The Radiation Act 592/1991establishes the conditions to prevent and limit harmful radiation effects to health of workers and the general public. Nuclear Liability Act 484/1972 & 588/1994 implements the Paris Convention on the Third Party Liability in the Field of Nuclear Energy and the Brussels Supplementary Convention. The amendment of 1994 adopts Joint Protocol bridging Paris and Vienna Conventions. As a result of the successful completion in early 2004 of the international negotiations to update the Paris and Brussels Conventions on Nuclear Liability, also the Finnish Nuclear Liability Act has been under review by a special governmental committee. It is foreseen, that in the near future the Act will be updated to reflect the modified conventions. Also setting an unlimited financial liability to licensees is under consideration. The Electricity Market Act 386/1995 opened access to the distribution networks and allowed foreign ownership of electricity supply. The Competition Act 480/1992 is compatible with EC directives on competition. Cartels and abuse of dominating position are prohibited by the act. Furthermore, the detailed Finnish licensing requirements for nuclear installations are outlined in the STUK regulatory guides YVL guides). The YVL guides now include more than 70 directives in the following eight series: general guides, systems, pressure vessels, civil engineering, equipment and components, nuclear materials, radiation protection and radioactive waste management. To curb Greenhouse Gas emissions, Parliament passed the National Climate Strategy (NCS) in June 2001. The NCS focuses on domestic measures as the best way to reduce the country's emissions, and includes an impressive array of programmes in all emission-producing sectors. The Government is presently preparing a new Climate Strategy and Energy Strategy to update the Climate Strategy of 2001. The new strategy will take into account development since 2001 such as the Emission Trading Directive and the entering into force of the Kyoto Protocol. In parallel with the domestic emission cutting measures, Finland will also explore in the new strategy the use of Kyoto mechanisms. The variability of Finnish emissions is high due to climatic reasons (i.e., hydro availability and heating needs in the winter). A great deal of emissions cuts are expected to come from the new nuclear power plant expected to come on-line in 2009. If the plant is delayed for any reason, the Finnish producers are able to buy emission allowances from the EU-market. The EU emission trading system of carbon dioxide is scheduled to start in 2005. The intended role of EU emission trading system is to provide one cost-efficient means for the EU countries for achieving their targets of the Kyoto protocol. The EU-15 countries are treated as one "bubble" in the Kyoto protocol, with country-specific targets agreed in the EU burden sharing agreement. With the emission trading system, a market-based cost is associated to carbon dioxide emissions, and emission allowances can be sold and purchased within the EU area. The first phase of the system covers energy production, oil refining, pulp and paper industry, metals industry and mineral industry. Combustion installations with thermal output above 20 MW are included in the system. The EU emission trading system will cover about 13 000 installations in the EU-25 area. In the first phase of the system, a major part of emission allowances are given as free allocation by the governments. It is expected that with the emission trading system electricity prices in the EU area will rise corresponding to the increase in marginal production costs caused by the carbon market price. In the Nordic electricity market marginal production is most of the year coal condensing power. Several studies have estimated that the average rise of electricity market price (in €/kWh) in the Nordic market will be about 75% of the carbon permit price (in €/tonCO2). It is generally expected that the emission allowance prices would remain well below 10 €/tonCO2 during the first phase of the trading program in 2005 - 2007. With the realization of the Kyoto emission reductions in the second period 2008 - 2012 higher prices are expected, depending on the gases and sectors included in the system. Emission trading will thus bring competitive advantage to carbon-free energy production forms. However, it is not clear how emission trading will affect investment decisions in low- or zero-carbon energy sources. The present emission trading system with specifications extending only a few years ahead has considerably increased the uncertainties related to the investment decisions. In most EU countries it is not known on which basis emission free allowances will be allocated to operators in the next phases of the system. There is a concrete risk that emission reductions realized in the first phase of the system will decrease the amount of free emission allowances obtained in the second phase. With the EU emission trading system, benefits for all carbon-free or low-carbon electricity producers selling electricity to the stock market will increase. In Finland, nuclear energy produced by Teollisuuden Voima Oy (TVO) is sold to its shareholders at cost price. Thus emission trading brings competitive advantage to its shareholders in the form of cheaper electricity. The stable and competitive price of electricity is of crucial importance for the Finnish energy-intensive industry. The stability of the electricity price will become even more important in the future with the probable rise and increasing volatility of stock market electricity prices due to the EU emission trading. The possible phase-out of nuclear power e.g. in Sweden and Germany will contribute to the price increase. However, the special market conditions of Finland with industry-owned nuclear facilities are crucial in investment decisions. Thus the Finnish situation can not be directly generalized to countries with usual electricity market-based investment decisions. An independent university group has conducted public opinion surveys on energy alternatives since 1983. Fig. 16 indicates how the attitudes towards nuclear power have evolved through the years. It can be seen that the public attitude was rather favourable towards nuclear power before the Chernobyl disaster. The survey taken immediately after the accident showed a drastic change in opinions. At that time only 14% were in favour of increasing nuclear capacity. The confidence lost in 1986 quickly returned by 1988 and the trend has been slowly improving since that. The latest poll in 2004 showed that 46% favoured expanded use of nuclear, while 25% were opposed. The change after the decision in principle of the fifth Finnish reactor is clear. The biggest uncertainty seems to concern nuclear waste. A question put in the opinion poll in spring 1999 concerned especially the opinion of the inhabitants living in those municipalities that were the candidate host communities for a spent fuel repository in Finland. The results showed that a clear majority of the people in Loviisa and Eurajoki agreed that a spent fuel repository could be sited in their home community, provided that studies can show that the encapsulation and disposal facility is safe. FIG. 16. Attitudes in Finland towards the use of nuclear power. 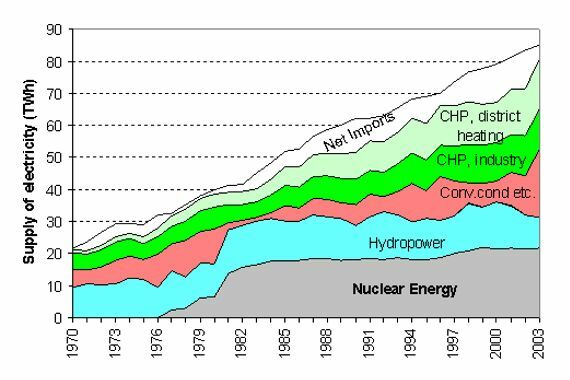 The development of the acceptance of nuclear power 1982 - 2004. Source: TNS Gallup Oy; Finnish Energy Industries Federation. National Climate Strategy. The Government's declaration to the Parliament. (in Finnish) VNS 1/2001 vp. 96 p, Helsinki, Finland. Energy Policies of IEA Countries Finland 2003 Review, International Energy Agency of OECD, 2004. IAEA Energy and Economic Data Base (EEDB). The Ministry of Foreign Affairs, Treaty Register. Data & Statistics/The World Bank, www.worldbank.org/data. IAEA, Power Reactor Information System (PRIS). Nordel Annual Report 2003 (incl. 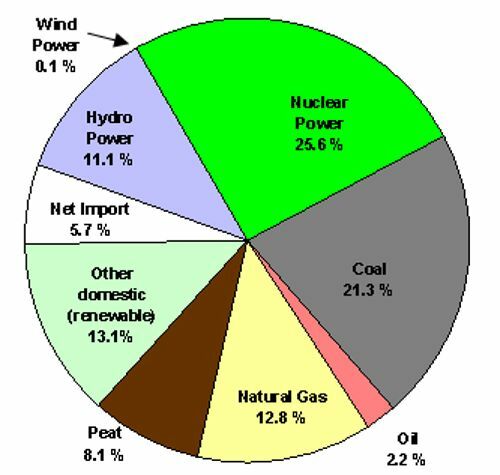 Energy Statistics 2003). 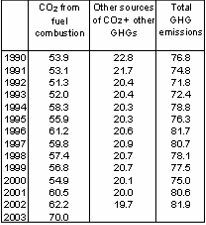 Greenhouse Gas Emissions in Finland 1990-2002 - National Inventory Report to the European Commission. Energy in Finland - Technology, economics and environmental impacts (in Finnish), VTT Processes, Edita (2004). Convention relating to civil liability in the field of maritime, carriage of nuclear material in Brussels [FTS 62/1991]. Zangger Committee; Communication received from Members regarding the export of nuclear material and of certain categories of equipment and other material; INFCIRC 209. Nuclear Suppliers Group, NSG; Communication received from Member States regarding the export of nuclear material, equipment or technology; INFCIRC/254 /Part 1, INFCIRC/254 /Part 2. Communication received on behalf of the European Community regarding transfers of nuclear material, equipment and technology; INFCIRC 322. Statements on full-scope safeguards adopted by the adherents to nuclear suppliers guidelines; INFCIRC/405. Communication received from the Member States of the European Community regarding the provision of certain additional information; INFCIRC/415. Agreement on common Nordic guidelines on communication concerning the siting of nuclear installations in border areas, [FTS 19/1977]. • Agreement for cooperation in the peaceful uses of nuclear energy between the European Atomic Energy Community and the United States of America, 12 April 1996. • Agreement for cooperation in the peaceful uses of nuclear energy between the European Atomic Energy Community and the Republic of Argentina, 29 October 1997. Agreement between the Government of Republic of Finland and the USSR concerning cooperation in peaceful uses of atomic energy, 14 May 1969 [FTS 38-39/1969, 113/1999]. Agreement for cooperation between the Government of Finland and the Government of Sweden concerning peaceful uses of atomic energy, 15 October 1968 [FTS 40-41/1970]. Agreement between Finland and Sweden on the guidelines to be followed while exporting nuclear material, technology or equipment, 4 March 1983 [FTS 20/1983]. Agreement between Finland and Denmark on the Exchange of Information and Reporting Relative to Nuclear Plants and Nuclear Events in Finland and Denmark, 25 February 1987 [FTS 27/1987]. Agreement between Finland and Sweden on the Exchange of Information and Reporting Relative to Nuclear Plants and Nuclear Events in Finland and Sweden, 25 February 1987 [FTS 28/1987]. Agreement between Finland and Norway on the Exchange of Information and Reporting Relative to Nuclear Plants ad Nuclear Events in Finland and Norway, 25 February 1987 [FTS 46/1987]. Agreement between the Government of the Federal Republic of Germany and the Republic of Finland concerning the Early Notification of a Nuclear Accident and the Exchange of Information and Experience Relative to Nuclear Safety and Protection Against Radiation, 21 December 1992 [FTS 35/1993]. Agreement between the Government of Finland and the Government of the Russian Federation on the Rapid Reporting on Nuclear Accidents and the Exchange of Information Relative to Nuclear Plants, 19 January 1995 [FTS 38/1996]. Agreement between the Government of the Republic of Finland and the Government of Ukraine on Early Notification of Nuclear Accidents and on Exchange of Information and Experience in the Field of Nuclear Safety and Radiation Protection, 8 February 1996 [FTS 66/1997]. 2 Using the definition adopted by the IEA and the CEC (nuclear power is converted into primary energy with a 33% gross efficiency, and hydro and wind power as well as imported electricity with 100% efficiency).